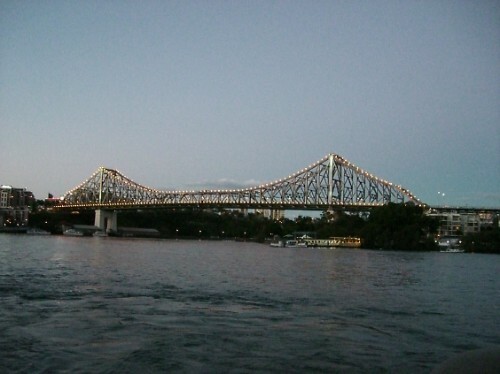 Blog from Brisbane, Queensland | Where is the Love? Finally the weather was something like we expected when we arrived in Brisbane and made the long walk from the bus terminal to our hostel Bunk. We only had one night in Brisbane and the bus to Rainbow beach was very early the next day to arrive in time for our Fraser Island briefing. We walked along the river front and the city was very built up, clean, and the communal areas were excellent. There was a man made beach lagoon where we got the taxi ferry to and walked around some more before noticing there was a dancing in the streets festival there that night. We went down and the Wallace's learnt a new diso routine to the jackson five before heading back to Bunk and an early night. Well what a waste of time that was. The on site bar was open to 5am and the music was pumping right up until close. Some very considerate dorm mates did not help either, still revenge was sweet when we had to get up at 6 am for the bus. Now very tired we headed off on the greyhound bus once again to Rainbow beach, our launch pad for Fraser Island.